Community demands for death with dignity developed in modern times as a result of the medicalization of death. Confusion has often surrounded the meaning of the term “dignity” at the end of life due to its association with both euthanasia and a peaceful, natural death. While it is recognized that dignity is both intrinsic and inviolable as a universal characteristic of all human beings, it is also experienced as an extrinsic characteristic which can be impacted by external factors. Modern views of dignity conserving care recognize that patient dignity is preserved when healthcare workers refrain from transgressing the patient’s standards and values, or refrain from forcing the patient to transgress his or her standards and values. 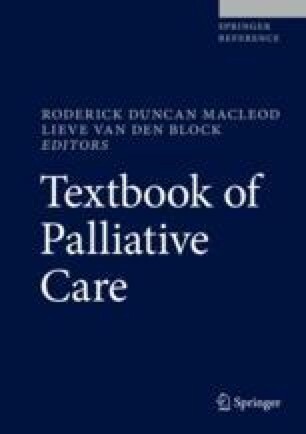 In this chapter, models of dignity in dying patients are detailed, along with empirically developed approaches to dignity conserving care. The essence of dignity conserving care is found to be socially constructed, individually perceived, culturally influenced, relational, and embodied. It is impacted by the perceptions of both the patient and the palliative care staff. The experience of dying with dignity is dependent on the dying person knowing that their loved ones, carers, and strangers perceive them to be as fully human as they are, regardless of their frailty. World Health Organization. WHO definition of palliative care. http://www.who.int/cancer/palliative/definition/en/. 2002. Accessed 20 Apr 2018.